You’ve probably heard mention of travertine floors or tiling, but do you know what a makes a travertine tile? Travertine is a classification of stone, specifically limestone, that can be using in various flooring or tiling projects. Travertine stone is the same chemical composition as other limestones; however, it goes through a process in the earth’s crust that applies additional heat and pressure changing the overall results. Additionally, other minerals will mix in with the limestone, creating unique colors that result in travertine. 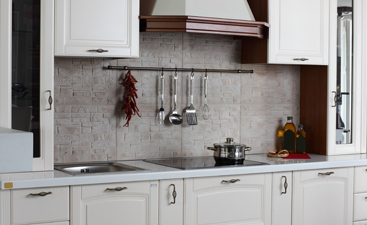 Most travertine tiles come from the countries of Mexico, Turkey, and Italy and are then exported around the world. 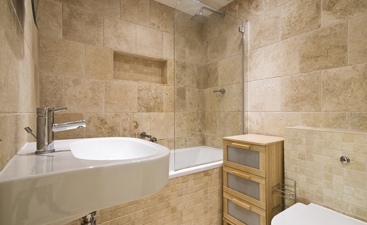 For a natural stone choice in your home, travertine floors are an excellent option. Travertine has been used for centuries for flooring and withstands even the toughest of wear. The one drawback is that travertine has a highly porous surface. Which allows water and dirt to enter into the tile. There are some travertine floor tiles that are processed to fill some of the pores and still leave the natural look, leaving is more resistant to stains. After placing travertine flooring, it’s important to seal the floor and protect it for the long haul. 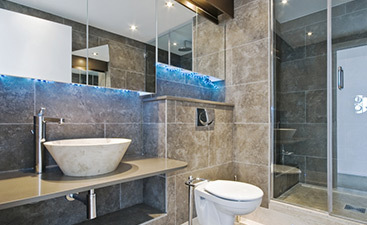 The original sealer will protect the tile and keep it from absorbing unwanted substances. As the seal gets walked on, it wears down. That’s why it’s so important to re-seal the flooring on regular intervals based on the amount of use the floor receives. Shop the wide variety of travertine tile available at Transworld Tile in the San Fernando area, or call us with any questions you may have!